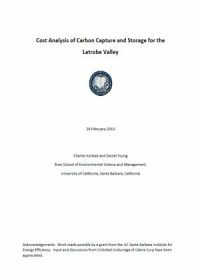 This report assesses the cost and economic environment of different carbon capture and storage (CCS) technologies, in order to make a decision regarding the best approach for capturing and then sequestering the carbon‐dioxide (CO2) from the emissions of a brown coal fired power plant in Southeastern Australia. In this report, carbon capture and storage is defined as capturing the CO2from the plant’s flue gas emissions and securing this CO2 in a location where it will probably not be re‐released into the environment. Avoiding CO2 emissions due to process changes is also considered. Specifically, we consider well known technologies that require captured carbon to be compressed and sequestered underground and a new approach proposed by Calera Corporation. This report will focus on the levelized cost of electricity generation for each technology, as a function of the price for CO2 emissions, to compare the Calera process with the traditional CO2 capture processes. We will assume the local economic conditions that prevail in the Latrobe Valley in Australia.